On a small scale, all lightning is essentially the same - a channel of ionized air carrying electrical current between two differing areas of charge. The polarity of lightning discharge can affect the way it propagates and branches in space and time, but in the end, it's all an electrostatic discharge - a 'spark' in its fundamental sense. The little 'static' sparks between your finger and a doorknob are, technically speaking, the same basic process at work, just on a smaller scale. The 'types' of lightning we'll discuss here refer more to how a discharge appears to an observer, what the starting and ending terminii of the channel are, and in what direction the formation of the channel took place. A lightning discharge between cloud and ground initiated by a downward-moving, negatively-charged stepped leader. Abbreviated "-CG". Negative CGs are more common than positive CGs. Most of the lightning you can see striking the ground in a storm is of the negative cloud-to-ground variety. Negative cloud-to-ground lightning strikes can be identified visually and in photographs by their distinctive downward branching (aside from the portion of the channel very close to the ground, where upward leaders can be branched upward). 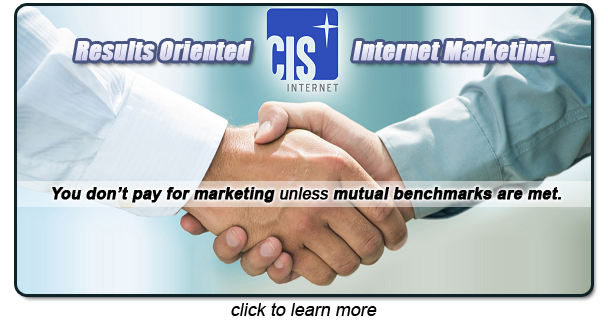 Negative CGs commonly consist of multiple "return strokes", which are additional pulses of current that illuminate the channel again and again. The first return stroke of a negative CG is usually the only branched one - the branches usually do not illuminate again in subsequent return strokes. A lightning discharge between cloud and ground initiated by a downward-moving, positively-charged leader. Abbreviated "+CG". Positive CGs are less common than negative CGs, and usually are associated with supercell thunderstorms and trailing stratiform precipitation regions behind squall lines. Positive cloud-to-ground lightning strikes can be identified visually and in photographs by their distinctive lack of branching (positive CGs occasionally will have branching at higher altitudes, but rarely near the ground). Positive CGs usually consist of only one return stroke, which is typically very bright and intense relative to other lightning activity in a storm. It is common for photographs of positive CGs to be overexposed unless the photographer has stopped the lens down significantly. Thunder from a positive CG is typically very loud, and many times sounds like a series of deep, low-frequency sonic booms. Sprites (see below) are usually associated with the more intense positive CGs. Ground-to-Cloud lightning (sometimes called Upward-moving lightning) is a discharge between cloud and ground initiated by an upward-moving leader originating from an object on the ground. 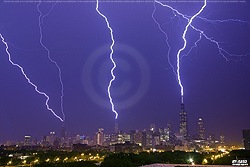 Ground-to-Cloud lightning strikes are common on tall towers and skyscrapers. GC lightning can also be either positive or negative in polarity. 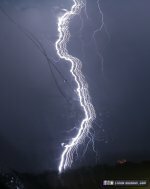 Lightning that demonstrates upward branching is a clear indication of a ground-to-cloud flash, though some upward-moving lightning is branchless below cloud base. The most common type of discharge - lightning inside a single storm cloud, jumping between different charge regions in the cloud. Intracloud lightning is sometimes called sheet lightning because it lights up the sky with a 'sheet' of light. All or parts of the actual channel may be obscured inside the cloud, and may or may not be visible to an observer on the ground. Not to be confused with cloud-to-cloud lightning. Anvil Crawlers are horizontal, tree-like, in-cloud lightning discharges whos leader propagation is resolvable to the human eye. In other words, the anvil crawler's movement is slow enough (compared to most lightning discharges) that a human observer or normal-speed video camera can see its rapid motion across the sky. This type of lightning (sometimes referred to as 'crawlers' or 'rocket lightning') often cover very large distances, resulting in vast, spectacular sky-filling discharges. A bolt from the blue (sometimes called 'anvil lightning' or 'anvil-to-ground' lightning) is a name given to a cloud-to-ground lightning discharge that strikes far away from its parent thunderstorm. A 'bolt from the blue' typically originates in the highest regions of a cumulonimbus cloud, traveling horizontally a good distance away from the thunderstorm before making a vertical descent to earth. Due to the final strike point being a significant distance from the storm (sometimes up to ten miles away), these lightning events can occur at locations with clear 'blue' skies overhead - hence the name. While many 'bolts from the blue' are positive flashes, some are not. Referring to a discharge (or a portion of a discharge) jumping from a cloud into clear air. Technically speaking, all cloud-to-ground lightning strikes contain 'cloud-to-air' components in the many branches that extend away from the main channel and terminate abruptly in mid-air. However, the most visually dramatic examples of cloud-to-air lightning occur when a long, bright lightning channel jumps out of the side of a cumulonimbus cloud and terminates in the clear air surrounding the storm. Bead Lightning is a name given to the decaying stage of a lightning channel in which the luminosity of the channel breaks up into segments. Nearly every lightning discharge will exhibit 'beading' as the channel cools immediately after a return stroke, sometimes referred to as the lightning's 'bead-out' stage. 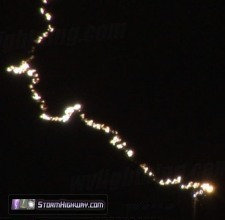 'Bead lightning' is more properly a stage of a normal lightning discharge rather than a type of lightning in itself. Beading of a lightning channel is usually a small-scale feature, and therefore is often only apparent when the observer/camera is close to the lightning. 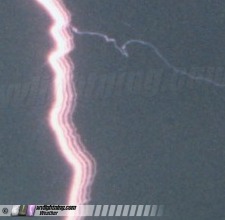 Ribbon Lightning refers to the visual appearance of a photographed lightning flash's individual return strokes being separated by visible gaps on the final exposure. 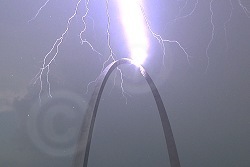 This is typically caused by wind blowing the lightning channel sideways during the exposure. The stronger the wind and closer the lightning strike, the more horizontal displacement will exist on the recorded image. Sheet Lightning is a term used to describe clouds illuminated by a lightning discharge where the actual lightning channel is either inside the clouds or below the horizon (not visible to the observer). Sheet lightning is, simply speaking, ordinary lightning (cloud-to-ground, intracloud, etc) that is hidden by clouds or terrain aside from the flash of light it produces. Electrical discharges that occur high above active thunderstorms. 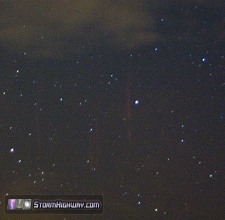 Sprites appear as vertical red columns. They have been found to occur in conjunction with and/or as a reaction to positive cloud-to-ground lightning discharges. They are swift and faintly lit, making them nearly invisible to the naked eye and difficult to photograph. These phenomena are best viewed at long distances from large thunderstorm complexes, at least 100 miles away. Cloud-to-Cloud Lightning: Somewhat rare type of discharge between two or more completely separate storm clouds. Not to be confused with common intracloud lightning occuring within one storm cloud. Ball Lightning: Ball Lightning is a rare phenomenon described as a floating, illuminated sphere that occurs during thunderstorms. It may move fast, slow or stay stationary, it may be quiet or produce a hissing or crackling noise, it may pass through windows, last from seconds to minutes, and disappear slowly or suddenly either quietly or with a loud bang. No definitive photographs have ever been obtained of ball lightning nor has any plausible scientific explanation been found for it to occur. Therefore, its existence remains questionable and is currently given the same scientific credibility as UFOs. 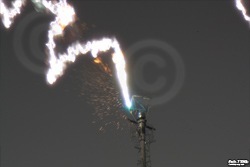 Furthermore, many ball lightning reports have been found to be nothing more than power line arcs and other unrelated events. Heat Lightning: 'Heat lightning' is simply ordinary lightning from faraway thunderstorms below the horizon. On a clear night, lightning flashes from a distant storm can be seen hundreds of miles away. Heat lightning got its name because it is often seen on hot summer nights, a time when thunderstorms are common. 'Heat lightning' often is early warning sign that storms are approaching, because the storm producing the lightning you're seeing could be moving your way. 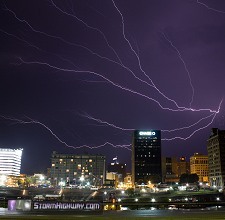 Staccato Lightning: A cloud-to-ground lightning flash that consists of only one return stroke. This animation depicts several types of lightning. Can you identify them?